The challenge runs from July 1 – August 25! 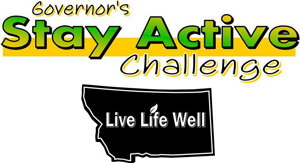 Governor Steve Bullock is proud to present our state’s first ever Governor’s Stay Active Challenge. In partnership with the Live Life Well State of Montana Wellness Programs, this challenge asks Montanans to make wellness a priority in their lives. The Governor’s Stay Active Challenge is an 8-week physical activity challenge for people of ALL fitness levels. The challenge uses steps taken as a baseline but includes all types of physical activity. There are team and individual registration options with no limit to team size. All members of the State of Montana health plan are welcome — employees, spouses, dependents, retirees and legislators. Participation is free and there are lots of prizes to be won! Posted in Active Living, Event, Programs, Statewide.